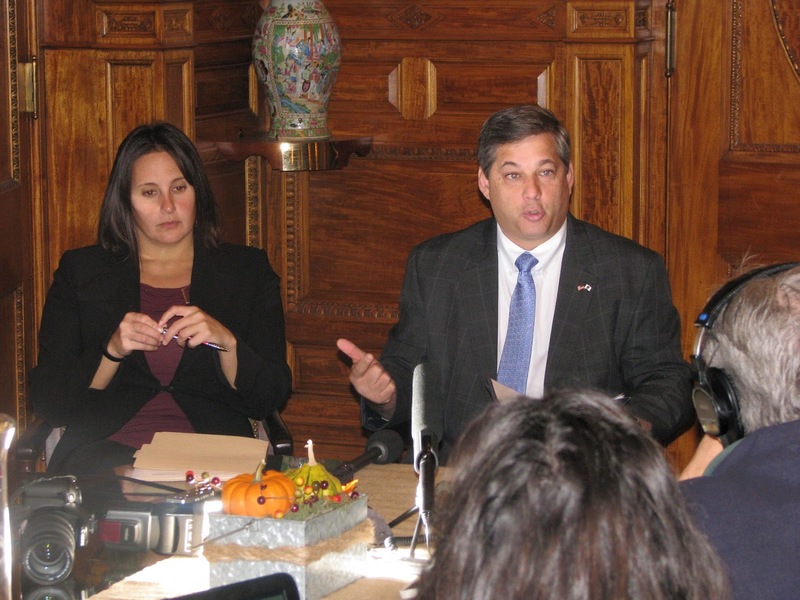 Protecting children from being improperly 're-homed' from one adult to another without documentation or oversight was the topic of a State House press conference that I gave today with my colleagues Senator Jennifer L. Flanagan and Representative Kay Khan in the office of Senate President Rosenberg. Responding to a growing trend that has spread across the country, Senator Flanagan and I have co-sponsored a bill that will make improper re-homing illegal in Massachusetts. News accounts and published reports of children being handed over in parking lots to complete strangers, who were not vetted by any government agency or placement organization, have illustrated that we must act quickly to close a loophole in the laws that are meant to protect children. Our bill creates criminal penalties for any person, other than a duly authorized agent or licensed placement agency, to place or receive a child through an advertisement. We also require adoption agencies to provide comprehensive information prior to the adoption. Below is a summary of the bill which will be debated in the Senate Thursday. Adds definitions for adoption “disruption” and “dissolution” to the general laws definition section for the Department of Early Education and Care (DEEC), section 1A of chapter 15D. Adoption disruption occurs when the adoption process ends after the child has been placed in an adoptive home and before the adoption is legally finalized. Dissolution takes place when the legal relationship between the adoptive parent and adoptive child is severed, voluntarily or involuntarily, after the adoption is legally finalized. Removes “in a newspaper distributed in the commonwealth” and “on a radio or television station” from the advertisement or notice for placement of a child section of chapter 15D. Requires a placement agency to provide a prospective parent with all relevant information about a child so that he or she can knowledgeably determine whether to accept the child for adoption. The requirement includes information on the mental, emotional, behavioral and physical health issues of the child and the child’s birth family, any prior placement history, and any other information that may be relevant. Also requires placement agencies to make available post-adoption services to adoptive parents and adopted children to help prevent disruption or dissolution of the adoption. Adoptive parent must contact the placement agency that facilitated the adoption if they are no longer able to care for the child. The placement agency must then contact the Department of Children and Families (DCF). If the placement agency is no longer in operation or reachable, the adoptive parent must contact DCF. Directs DEEC to create a uniform orientation curriculum for adoptive parent applicants, with specific information for adoptive parent applicants seeking to adopt international children. The curriculum will provide notice of the penalties in section 11A of chapter 210 for facilitating or participating in an illegal adoption. Clarifies penalties for violations of section 6 of chapter 15D, the DEEC section on licensing of child care programs and placement/approval of foster homes. • Subsection (a) defines “published” to be any computerized communication system including but not limited to electronic mail, internet site, internet profile or any similar form of communication via the internet. • Subsection (b) establishes that any person or entity, aside from a duly authorized agent or employee of DCF or a licensed placement agency who causes to be published, disseminated or broadcast an advertisement or notice for the placement of a child under 18 or in any way offers to place or locate children offered or wanted for adoption or permanent placement will be punished by a fine between $5,000 and $25,000. • Subsection (b) further provides that a person who accepts payment in return for placing a child for adoption or permanent physical placement will be punished by a fine between $5,000 and $30,000, or by imprisonment in a jail or house of correction for not more than 2.5 years or in state prison for not more than 5 years, or both fine and imprisonment. • Subsection (c) requires that anyone who publishes, disseminates or broadcasts an advertisement or notice for placement or reception of a child under 18 for family child care, large family child care, child care center care, school-aged child care program, group residential care or temporary shelter care will be punished for each violation by a fine of up to $5,000, or by imprisonment in a jail or house of correction for not more than 2.5 years, or both fine and imprisonment. • Subsection (d) provides that any person who violates subsections (a), (b) or (d) of section 6 of chapter 15D will be punished for each violation by a fine up to $5,000, or by imprisonment in a jail or house of correction for not more than 2.5 years, or by both fine and imprisonment. Subsection (a) of section 6 of chapter 15D prohibits the unlicensed operation of child care programs. Subsection (b) of section 6 prohibits maintaining a child in family foster care without placement, supervision and approval by a placement agency, unless that person is licensed by DEEC. Subsection (d) of section 6 prohibits placement of a child in a foster home before approval of the home by DEEC or an individual or agency licensed by the department under this section, except in an emergency placement in a foster home limited to relatives or long-term friends of the child’s family. • Subsection (e) provides that DEEC may file a petition for the superior court to have jurisdiction to enjoin any violation of section 6 or to take other action that equity or justice may require. Adds language to section 6 of chapter 210 of the general laws stating that no decree of adoption will be entered by the court until the petitioner for the adoption executes an acknowledgement of the criminal penalties available under section 11A for the unauthorized adoption or placement of a child. Failure of the court to provide for the execution of the acknowledgment is not grounds for per se invalidation of the adoption. This section expands section 11A , the penalty section for illegally offered adoption services, to include new penalties. • Subsection (b) further provides that a person who accepts payment in return for placing a child for adoption/permanent placement will be fined between $5,000 and $30,000, by imprisonment in jail or a house of correction for not more than 2.5 years or in state prison for not more than 5 years, or both fine and imprisonment. • Section (c) requires that any person unrelated to the child by blood or marriage, and not part of an organization that is a licensed or approved placement agency, who receives a child for adoption or permanent physical placement following an advertisement in violation of subsection (b) be subject to a fine between $10,000 and $40,000, imprisonment in jail or a house of correction for not more than 2.5 years or in state prison for not more than 5 years, or both fine and imprisonment. • Section (d) provides that a parent or legal guardian who causes a child to be adopted or placed in permanent physical placement in violation of this section will be imprisoned in state prison for not more than 20 years and by fine of not more than $25,000. A task force will be created to identify likely channels for abuse, including legal vehicles, in the re-homing of children. It will submit a report on the likely channels for abuse in the rehoming of children and any recommendations for responding to potential or actual abuse, no later than June 30, 2016. The task force will be comprised of the following members or their designees: the Chief Justice of the Probate and Family Court department; the Commissioner of Early Education and Care; the Commissioner of Children and Families; the Child Advocate; the Chair of the Children’s League of MA, Inc.; and two appointees by the Governor who have expertise in child welfare.